Home.... REVIEWS.... TOC..... Podcasts.... Q & A.... Buttons.... Buy It!. "What a charming little manualand what a delightful way to learn about podcasting! 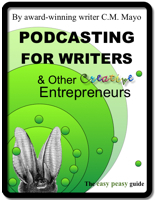 With Podcasting for Writers, C.M. Mayo generously offers writers and other would-be podcasters a step-by-step guide to the process of creating an audio recording for the internet. Coming at it with full understanding of the hesitancy others may feel about attempting to podcast, she provides encouraging words, makes her instructions clear and straight-forward, and provides many tips that will help others head off glitches at the pass. In addition to her easy peasy ten steps, which are just that, readers are treated to the choice images, ingenious similes, and clever humor that are this writers hallmarks. Learn about podcasting while Mayo calls into your mind images of guitarists with mutton chops, Edith Wharton blogging, and kids at pond-side tiddlywinking peas. The book is packed with resources, and the collection of interviews with other writer-podcasters in the appendices are wonderful. If you have a yen to podcast, grab this book and your voice will be on line before the tiddlywink hits the pond." "Very helpful and inspiring. And even more helpful if you read it online because it has lots of links to recommended podcasts, podcast hosting sites, and many references. Plus it's a fun read. Takes away all the mysterious mumb jumbo. I especially enjoyed the interviews with other podcasters. This book really opened my eyes to the possibilities in podcasting." "Aspiring writers don't miss this one! This is a wonderful short book for those of who are aspiring writers and looking for help to create podcasts"